A sorority sister tapped me onto this site and it is an absolute look-see for you discriminating dog owners out there. Per the Bio, Rover was founded when new dog owner and co-founder AnneMarie Minardi found a lack of classic, well-made dog clothing and accessories for her puppy, Ella. She had found that most pet clothing found in even high-end boutiques was poorly made with little attention paid to the quality of materials, durability and design. Instead, doggie wardrobe options were saturated with frilly, glittery, and impractical garments that had little design value. On the other end of the spectrum was the utilitarian clothing sold at outdoor and hunting stores that was certainly rugged, but far from fashionable. AnneMarie soon recognized the need for a happy medium: durable and well-designed clothing for dogs of all sizes and breeds. After combining their experiences in business, fashion and graphic design, AnneMarie and partner Gillian Ward launched Rover in Fall 2007 with the 2007 Holiday collection as well as the 2008 Spring/Summer collection. 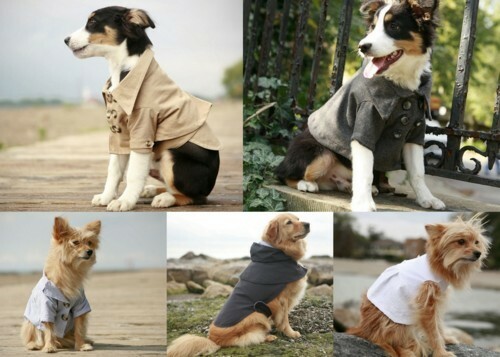 Both collections included a selection of shirts, dresses, outerwear and accessories in six sizes to accommodate dogs from the very small to the very big, with a made to order service to fit everyone in between. So cute! Granted, it is a little on the pricey side, but if you want a fabulously dressed pet, this is the site.